The first week of school grades K-5 created a monochromatic self portrait. They learned that monochromatic means "one color" and they demonstrated their knowledge by creating a self portrait with a single color. Check out the amazing work of Burns Park's artists! Students' created these fun animated creatures while I was out sick. The end results were too fun not to share! 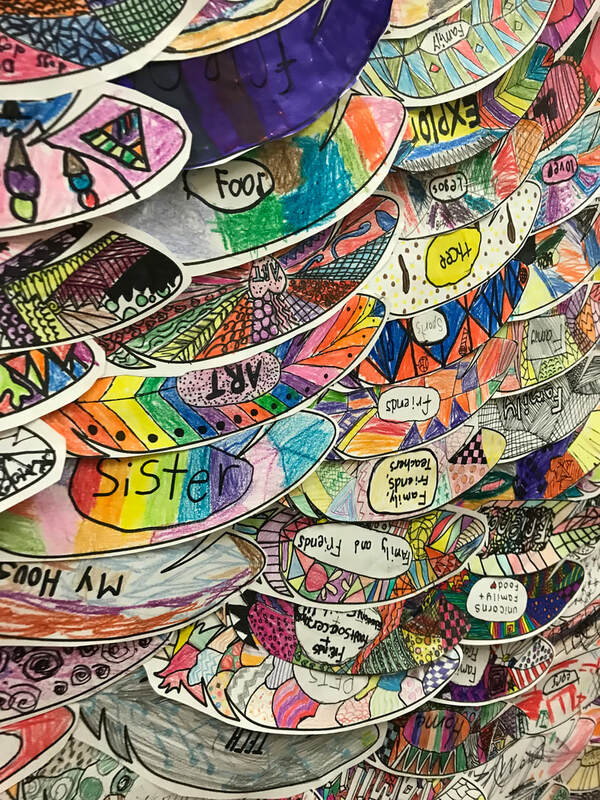 Y5-5th grade designed a feather inspired by Kelsey's wings titled "What Lifts You". The students wrote what they were thankful for on their feather and created their own patterns around the word. All of the feathers were then used to create 2 large wings for the Burns Park community to stand in front of and take pictures just like Kelsey Montague's wings. Come check them out when you get a chance they are on the 2nd floor by the gym and the lost and found!